24 servings and 146 calories. Combine 1 1/2 cups white sugar, butter or margarine, vanilla, and eggs. Mix well. Stir in flour, lemon juice, baking soda, and salt. Blend well. Shape dough into 1 inch balls. Combine 2 tablespoons sugar and 2 teaspoons ground cinnamon. Roll dough in sugar/cinnamon mixture and place 2 inches apart on ungreased baking sheets. Bake 8 to 10 minutes or until set. Immediately remove from cookie sheets. Peanut butter and chocolate come together in these great cookies and are ready in an hour! Heat oven to 375°F. In a large bowl, beat 1/2 cup granulated sugar, the brown sugar, peanut butter, butter and egg with electric mixer on medium speed, or mix with a spoon, until well blended. Stir in flour, baking soda, and baking powder until dough forms. 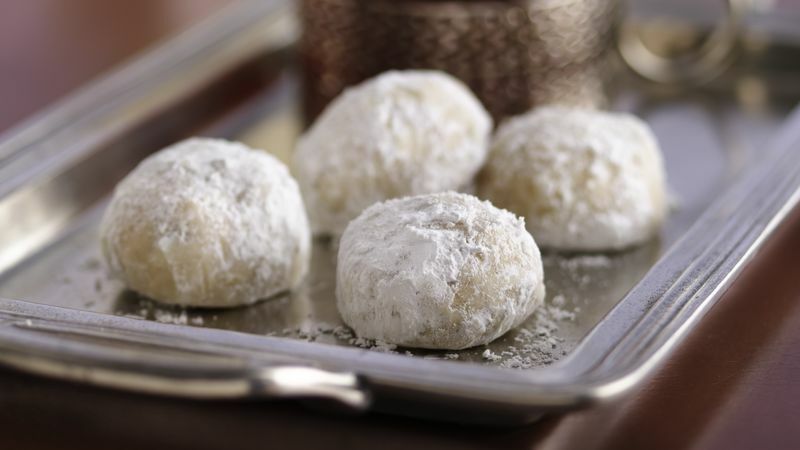 These buttery melt-in-your-mouth cookies go by many names but they are always twice rolled in powdered sugar and filled with finely chopped nuts. Mix butter, 1/2 cup powdered sugar and the vanilla in large bowl. Stir in flour, nuts, and salt until dough holds together. 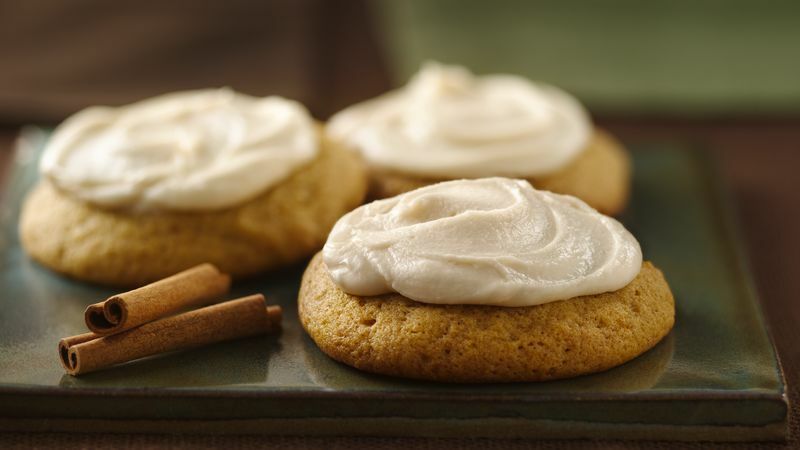 Pumpkin and spice star in a melt-in-your-mouth cookie topped with a special homemade frosting. Heat oven to 375°F. In a large bowl, beat granulated sugar, brown sugar, 3/4 cup butter and 1 teaspoon vanilla with electric mixer on medium speed, scraping bowl occasionally, until well blended. Beat in pumpkin and eggs until well mixed. On low speed, beat in flour, baking soda, cinnamon, and salt. In a medium bowl, place powdered sugar, 1 teaspoon vanilla, and 3 tablespoons milk. In 1-quart saucepan, heat 1/3 cup butter over medium heat, stirring constantly, just until light brown. Combine sugar , cocoa, and milk in a medium saucepan. Stir to blend, then bring to a boil, stirring constantly. Reduce heat and simmer. Do not stir again. Place a candy thermometer in pan and cook until temperature reaches 238 degrees F(114 degrees C). If you are not using a thermometer, then cook until a drop of this mixture in a cup of cold water forms a soft, ball. Feel the ball with your fingers to make sure it is the right consistency. It should flatten when pressed between your fingers. Tip: Aluminum foil can be used to keep food moist, cook it evenly, and make clean-up easy. Now that you have multiple Traditional Holiday Treat recipes to try, go and enjoy some baking. Next Post Cinnamon & the Benefits it has For Your Health.